BRIDGEPORT, Texas – Every sport needs historians. Charlie Throckmorton is that for ProRodeo. For folks in north Texas, the added benefit is that Throckmorton also is the announcer for the annual Butterfield Stage Days PRCA Rodeo, set for 7:30 p.m. Friday, May 10, and Saturday, May 11, at Bridgeport Riding Club Arena. 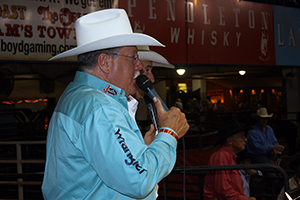 Charlie Throckmorton has been one of the best announcers in ProRodeo for decades, having called some of the biggest events in the sport. He’ll be on hand in Bridgeport, Texas, to announce the Butterfield Stage Days PRCA Rodeo, set for May 10-11. It’s a powerful combination that serves rodeo fans quite well. “Charlie’s the best in the business,” said Loydd Williams, chairman of the committee that produces the annual rodeo. “It takes someone with the heart and passion to be involved in it. Charlie has that and a great voice that resonates with fans. Throckmorton has called the action in Bridgeport for all seven years it has been part of the Professional Rodeo Cowboys Association and the Women’s Professional Rodeo Association. He’s watched it grow each year and seen how cowboys have come to respect the competition in Wise County. “Bridgeport, Texas, started through the years as a little open rodeo, a little country rodeo,” said Throckmorton, a PRCA card member since 1987 from Grandview, Texas. “They stepped up to the plate and got it sanctioned with the PRCA. Then they stepped it up another notch with high-definition big screens, which really helps the fans experience the rodeo. Throckmorton has seen it up close and personal and continues to be a vital piece of the puzzle. It takes a quality announcer to understand the little nuances and adapt to the constant changes that come with producing an elite rodeo, like the one that happens each May in Bridgeport. That’s part of the job description for rodeo announcers. Almost all the competition is unpredictable, so it takes a quick mind – and oftentimes a quick wit – to tackle all the tasks. “There are so many good people there, and that rodeo is not through growing either,” Throckmorton said. “You went from crawling to walking, and now you’re going to run. There’s so much history in Bridgeport, then you have the Butterfield Stage Days and the Butterfield Stage Coach. The stage coach lines ran 200 feet from that arena. You can visualize all that history. You have these high-def. video boards and this great production, but this rodeo still has the cowboy basics of the 1800s, and you can visualize the original Butterfield Stage running west. He knows that as well as anyone. He’s worked some of the biggest events in the sport, from the Clem McSpadden National Finals Steer Roping to the Fort Worth Stock Show and Rodeo to the Ram National Circuit Finals Rodeo. He was inducted into the Texas Rodeo Cowboy Hall of Fame in 2007, and he’s recognized as one of the greatest voices in the game. “I’m into rodeo because I love the sport. I tried to compete, but I couldn’t beat anybody,” he said. “I’ve grown up with it. I had an arena in my back yard, and I had world champions that schooled me. I still couldn’t do it. I know what it feels like in the arena and the crow’s nest. There are plenty who admire Throckmorton, too. He realizes his place at a rodeo is to be there for the fans and to enable the production to be better; he’s the in-arena salesman who shares his passions with those who watch the excitement.